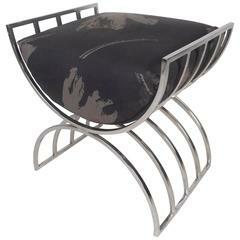 Stunning Mid-Century Modern style stool with streamlined waterfall base design in polished black nickel. The bench is upholstered in luxurious rabbit fur in variant hues of grey. Great accent piece for any room and also great as an ottoman. 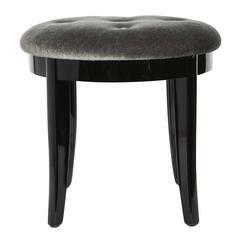 Art Deco vanity stool in a luxurious gunmetal mohair with a black lacquered finish. The stool features a round seat design with slightly splayed legs, and button seat details. American designed 1930s large round upholstered stool or ottoman with removable lid for storage on solid walnut base. New heavy multi color textured fabric.